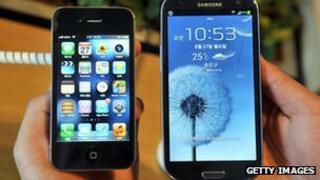 Samsung has said that it will stop taking rivals to court over certain patent infringements for the next five years. The white flag in the patent battle has been raised because the South Korean electronics firm faces a huge fine for alleged abuses of the system. The move could help end a long-running patent war between the world's largest mobile makers. The EU said that a resolution would bring "clarity to the industry". "Samsung has offered to abstain from seeking injunctions for mobile SEPs (standard essential patents) for a period of five years against any company that agrees to a particular licensing framework," the European Commission said in a statement. Standard essential patents refer to inventions recognised as being critical to implementing an industry standard technology. Examples of such technologies include the Universal Mobile Telecommunications System (UMTS), a cellular standard at the heart of 3G data; and H.264, a video compression format used by YouTube, Blu-ray disks and Adobe Flash Player among others. The EU had accused the Samsung of stifling competition by bringing a series of SEP lawsuits against Apple and other rivals. Google's Motorola Mobility has been charged with similar anti-competitive practice. Samsung faced a $18.3bn (£11.3bn) fine if it was found guilty of breaching anti-trust laws. "Enforcing patents through injunctions can be perfectly legitimate, said Joaquin Almunia, the European Commission's vice-president in charge of competition policy. "However, when patents are standard-essential, abuses must be prevented so that standard-setting works properly and consumers do not have to suffer negative consequences from the so-called patent wars. "If we reach a good solution in this case, it will bring clarity to the industry," he added. Samsung and Apple are currently battling each other in courts in more than 10 countries across Europe. Interested parties have been given a month to comment on the proposals.